Please can anyone explain how to save maps/directions using Bing Maps (simple terms please). I have signed in using my Microsoft account,clicked on "My Places" and saved,or so I thought. Upon opening Bing Maps again The Title of the saved map appears but says not saved or words to the effect,seems to go round in circles. There must be an easy way to do this,or so I thought!. I have searched the web for a solution only to read what I have been doing. rdave13, that is one of the sites I got info as to what to do. Can I just say that I am using Windows 7 on PC. 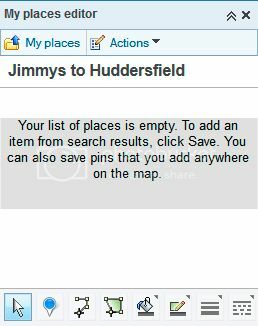 I save the map to MY Places,then when I open My Places again I get the the map that was saved eg "Jimmys to Huddersfield",then when I click on Jimmys to Huddersfield I get the following message in the My Places box.